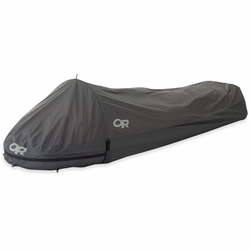 Outdoor Research Helium Bivy. Made from ultra-lightweight, waterproof and breathable Pertex® Shield+, the Helium Bivy™ is a true minimalist bivy for fast and light solo expeditions. Weighing in at a feathery 18 ounces, and featuring a classic clamshell design and durable 70D nylon floor, this storm-proof shelter is ready for season after season of adventuring.